One of the core reasons the APS™ was created was to help warn the public about asset protection planning which is faulty, suspect or sometimes criminal. To read about the list of questionable planning the APS™ has already identified and would counsel the public and other advisors to stay away from, please click here. Some advisors think of questionable planning as “garbage.” the term is not terribly eloquent, but it seems to fit well with some of the advice being giving in the APS™ community. Because of the amount of quality advisors who have been “Rated” by the APS™, there is a nice group of advisors of all kinds nationwide who have already agreed to uphold a standard of care when dealing with asset protection planning. As such, these advisors have agreed to report immediately to the APS™ any questionable AP planning they see in the marketplace. Once questionable AP planning has been identified, the information about it is disseminated to various “Rated” advisors who will research the topic, concept or advice in question and make a report to the APS™ advisory board. The board will then make a recommendation about the questionable AP plan and will put out a notice of warning the public and “Rated” members. 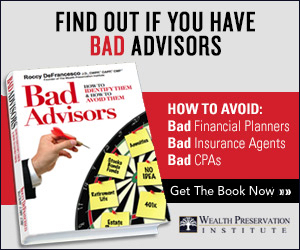 It is not enough to have just “Rated” advisors helping protect the public. The public is really in the best position to help. Why? Because if there is a new questionable AP plan on the street, the public is first in line to see that when it is pitched or sold. Typically, several bad plans can be sold before a quality advisor hears of it. Because of this, it is vitally important to have your help when trying to keep people safe from scammers or those pitching garbage. If you have been pitched something you would consider faulty, suspect, or criminal, involving any of the following topics, please immediately report it to the APS™. Someone will make contact with you shortly after receiving your notice and a review of the plan or advice in question will begin immediately. This review by the APS™ will be FREE of charge. That’s what the APS™ is here to do and we welcome submissions by the public. It will usually only take a matter of days for the APS™ through its resources to research and come to a conclusion on any matter. To report a questionable AP plan, simply Email Us.